Ten years after Beijing's famed Central Business District (CBD) was founded, the 4-sq-km cluster of modern highrises and international office buildings is set for an expansion eastward that will almost double its size after the Beijing municipal government approved the move in May. The public got its first view of possible plans for the new area at the opening ceremony of the 10th Beijing CBD International Business Festival on October 12, when seven urban planning and design firms unveiled their visions. The municipal blueprint calls for the boundaries of the CBD be extended to the East Fourth Ring Road, an expansion of about 3 sq km. The existing business zone is bordered by Jianguomenwai Street on the south, Chaoyang Road on the north, Dongdaqiao Road in the east and West Dawang Road in the west. Developed for industries such as finance and media, the expanded area is intended to further consolidate Beijing CBD's position as a leading international business hub in China. Firms and partnerships whose plans made it to the finals of the selection process included Skidmore, Owings and Merrill LLP (SOM) from the US, Foster & Partners from Britain, a joint team comprised of US-based Kohn Pedersen Fox Associates (KPF), Beijing Institute of Architectural Design and Zhonghong Design, ADP-i from France, as well as a joint team of China Academy of Urban Planning and Design and Space Syntax from Britain, the Tsinghua Urban Planning and Design Institute and Guangzhou City Planning and Design Institute. A panel of experts from home and abroad announced their decision on October 16, when SOM took first place honors, followed by the team of KPF, Beijing Institute of Architectural Design and Zhonghong Design. Third-place went to the team of China Academy of Urban Planning & Design and Space Syntax Ltd.
"The competition marks the start of Beijing CBD's eastward expansion," said Cheng Lianyuan, head of the Chaoyang district where the CBD is located. "We will make a final blueprint based on proposals from the seven participants while considering suggestions from other experts and the concerns of the public," he added. One feature of the plan proposed by SOM is three public parks connected by two boulevards and separate zones for recreation, retailing and exhibitions. Efficient traffic flow was also a major element of the plan, which proposes use of trolley buses and more parking spaces in the CBD's new area. SOM also asserted that every road in the area would have bicycle lanes. SOM is one of the largest architectural design companies in the world, with businesses in more than 50 countries and regions. 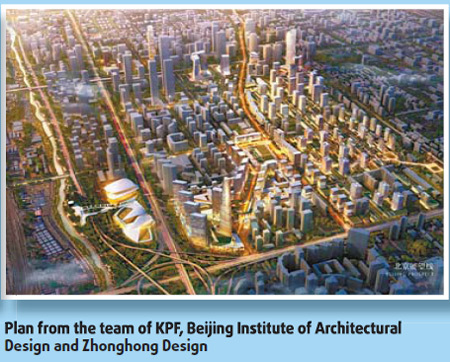 Its designs in China include the third phase of World Trade Center in Beijing.